Hello and welcome back to Deckspace, where we discuss offbeat Netrunner deck concepts. For this final article of 2014 we’re going to cover one of my favorite decks in all of Netrunner, and that is Anarch Resource Denial. There are many variants to this archetype, but today we are going to cover the Breakerless Quetzal version. At time of writing, Quetzal can pass through 20 (19) of 24 printed Barriers without a Breaker. The four (five) are Hadrian’s Wall, Curtain Wall, Hive and Ashigaru (and NEXT Silver sometimes). Why do I love this deck so much? Because on paper, it looks like it shouldn’t work. It looks like you should run of steam, get locked out and die miserably. But what actually happens is wonderful: you break yourself in crazy, borderline suicidal Runs and drag the Corp down to your level. Except once both you and the Corp are broke, you suddenly have the upper hand; every server can be accessed for a single click, and you aim to keep them that way for as long as possible. I should warn you; playing this deck is like playing Land Destruction in Magic: The Gathering. 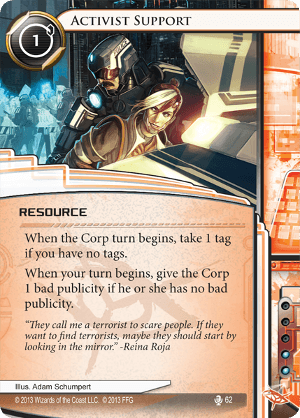 You will not make any friends playing Resource Denial; at its best, this deck prevents the Corp from doing what it wants and forces it to be broke, taking its entire turn to click up two credits and trash a Fall Guy while you steal agendas from HQ and R&D. Mulligan for Account Siphon. 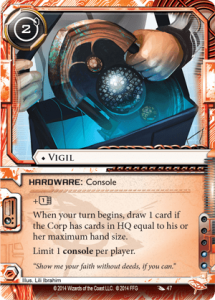 You can usually expect to see most of your deck throughout a game as you try to slow down the Corp to a crawl, so finding and landing good Siphons is priority number one. Playing this turn one, click one is often correct. 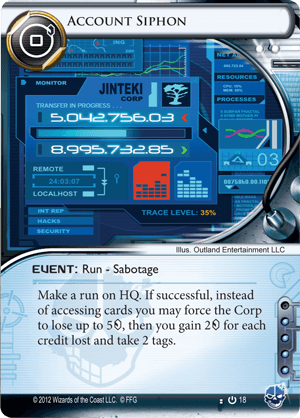 If Jinteki goes ICE ICE Hedge Fund, Siphon them through their stupid Komainu. Facecheck everything recklessly. Your number one goal is to find a soft server and abuse it relentlessly. If no soft server exists, use the cards in your hand to create one. If none of the cards in your hand allow this, draw until you find a way. There is always a way. Your strategy should always evolve based on what you draw and what the Corp is trying to do. If you have a Siphon in hand or can Deja Vu a Siphon back, try to engineer a situation where you can steal 4+ credits from the Corp, setting them back a whole turn and giving you the money you need to get more accesses. You can fetch any card with this, not just two viruses. When it comes to recurring Account Siphons, this card is just as good as Same Old Thing. Sometimes even better if money is no object. Shaking off the tags from a Siphon is almost never correct. 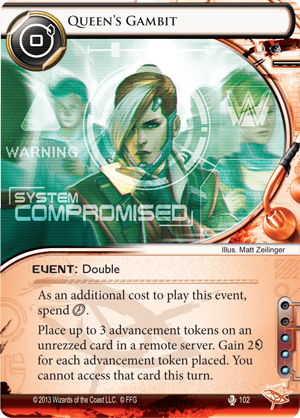 You are playing hard Tagme, even against Weyland. Taunt them to Scorch you post-Siphon; as long as you stay above four cards and maintain your aggression, they won’t be able to build up the six credits and two cards necessary to double Scorch you. Imp is your first line of defense against Scorched Earth, and Imping it out of HQ is key. Closed Accounts hurts but is nonfatal and should be played around if you suspect it; if you’re flush with cash, save an Armitage Codebusting for a rainy day. Knight will get you in where you to go, but make sure you’re getting good value off your accesses. If you find yourself paying four credits for a random R&D access, something has gone horribly wrong. ICE usually has a weakness: if it has high strength but only one subroutine, it’s weak to Knight. If it has many subroutines but low strength, it’s weak to Parasite. If it has many subroutines and high strength, it’s probably expensive, so it’s weak to Rook, Lamprey and Account Siphon. If it’s Architect, just don’t run that server anymore. Inject was a massive gift from Up and Over, but its release came at a price – him. If you have no Siphon, you should look to make punishing runs. Imp, Rook and Lamprey all enable this, and they work great in tandem. With a Lamprey or Imp already installed, Rook their HQ ICE and watch them sweat. If they can’t afford to rez, Lamprey gives you a soft lock. You run their HQ twice, eating two of their credits and getting two free accesses. If you’re the Corp in this situation, what do you do? The ICE on HQ is a 5-to-rez Enigma. The Runner just drained you down to 2 credits. Do you click back up and pay 5 for your Enigma, going flat broke and unable to rez the R&D ICE? Can you trash the Enigma with another piece of ICE you have in hand? If it’s expensive, you’re naked. If it’s porous, you’re asking for a Siphon, or more bites from the Lamprey. 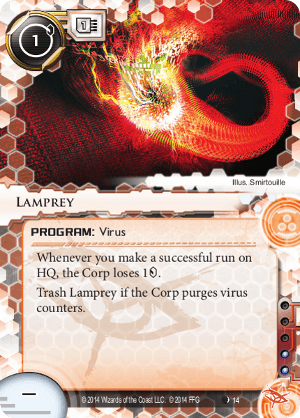 Do you purge to trash a single Lamprey, likely having to discard a card from HQ from the hand size limit? This is the kind of no-win situation this deck can engineer. Do not underestimate the power of this card. The damage it causes is very real. Eventually there will come a time where all servers are protected, or at least taxing to run. When this happens you can start drawing up, either clicking to draw or using Inject. Look for Parasites, recurring two with Deja Vu if possible. Parasite is your reset button; it puts the Corp back into the early game where a server is suddenly defenseless and accesses are free. Note that your Parasites are not fast, Datasucker-assisted Parasites but slow ticking time-bombs. You’re perfectly content to just Parasite a Tollbooth and wait for it to time out. There are other servers you can run while your virus is chewing through the ICE. And if there aren’t any other servers to run? That’s where the resource package comes in. John Masanori and Joshua B should be installed at the first opportunity. While Masanori is just a nice source of clickless card draw (try to trigger him every turn when possible), Joshua B is completely and utterly insane. Trigger it every turn, no exception, and enjoy your 1-cost Rachel Beckman. Any Corp worth their salt will trash him on sight; if they don’t, you’ll most likely win. You can’t shake off the tag if you take the click, but why would you want to? Make them trash it, then install another the following turn. For the Corp, trashing a resource sets them back an entire turn. As such, you can use your resources as bait to buy time while you find the cards you need or Parasite finishes off the ICE. But once all else has failed, the backup plan is Data Leak Reversal. Even after all is said and done, Archives is usually soft enough that you can make a successful run, maybe requiring a surprise Knight. And this is when you install Data Leak Reversal. If you’ve been diligently installing Fall Guys, you can get up to three full turns of Data Leak Reversal use; that is 12 random cards you will access from the top of R&D while the Corp scrambles to trash your lethal Resource. 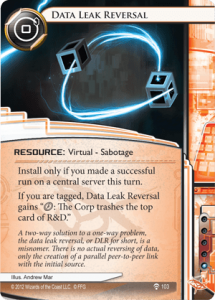 If the Corp doesn’t respect the Data Leak Reversal, install Joshua B and mash on the DLR five times a turn until they do. They will run out of cards before they can score seven points. This deck aims to turn every game into a battle of attrition; and Runners have the upper hand when it comes to attrition. If you can force the Corp into clicking for credits every turn, you’ll find that that your four clicks beat their mandatory draw and three credits. You might notice I never mentioned Quetzal’s ability. That’s because we’re not trying to build around it; it’s just a perk that enables aggression. It’s likely to invalidate a full third of the Corp’s ICE unless they start stacking them two deep. A lot of Corps will simply trash their Barriers from hand as they draw them, which is fine; blanking 6+ ICE from the Corp’s deck is a worthy Identity ability, and it’s less ICE for your Parasites to chew through. As with Street Chess two weeks ago, this deck’s matchup against Blue Sun is miserable. In this case, I wouldn’t even bother playing it. They usually play three of the four Barriers that stop Quetzal dead. Face-checking ICE fails to deny them economy as they can simply bounce whichever ICE is not longer relevant. Your Parasites will never eat a single piece of ICE through, and Knights will be trashed at little to no cost. You have no way to deal with the Oversight AI-Curtain Wall combo short of Imping it out of HQ, and they can always muster up the six credits necessary to double Scorch you by bouncing a medium-sized piece of ICE. Just be smart and go raid another Corp. There are plenty to choose from. Except if you’re in a tournament, but hey; I never promised these decks would be tournament worthy. Tag punishment hurts, obviously, as we’re always floating tags. Scorched Earth is the main boogeyman, but Closed Accounts can and will set you back when it lands. The real killer though is Freelancer, immediately giving the Corp 4 credits and two actions for free. Yes, this card exists and it will wreck you. Thankfully, in a world without Sideboards, it will never see play. Any Corp whose economy is robust enough to survive your assaults is trouble. If they drown you in more economy assets than your Imps can trash, you’re liable to fall behind. Your gameplan demands that you trash every economy asset that gets rezzed, but this can become very difficult when you’re staring down a Marked Accounts guarded by a Pop-up Window. Imp is a massive help in this case. Corps that can function on little to no economy (NBN with Shipment from SanSan) are trouble, as denying their economy will not slow them down. If they never hold more than 3 credits, it’s hard to get a good Siphon in. If all their cards are cheap, you will struggle to keep pace with them. A deck full of Quandaries, Ice Walls, Wraparounds, Dracos, Eli 1.0 and Pop-up Windows is your worst nightmare. Swordsman eats Knight but is eaten by Parasite. Wraparound is broken by Quetzal, but the second one will have to be Knighted. Lotus Field is immune to Parasite, making it into a permanent tax with Knight. Architect is completely and utterly miserable to see; you have no economical solution to it, and its use is widespread. NAPD is horrible for you, as you usually run on fumes and the four credits to steal will usually break you, if you can even afford it. Note that you can’t use Fall Guy for money after you see the NAPD; there’s no window to use it. Account Siphon is what makes this deck viable. You can land up to six Account Siphons in a game; you shouldn’t need any more than that to win. As soon as you draw the Siphon, look for ways to make it stick. Dirty Laundry is often just an Easy Mark, which is what this deck really wants: a way to go from broke to not-that-broke. Use the run if you can get value from it safely (with Masanori if possible), but don’t be afraid to just blow it into Archives for a three credit click. Never Dirty Laundry naked assets that could be Jackson. 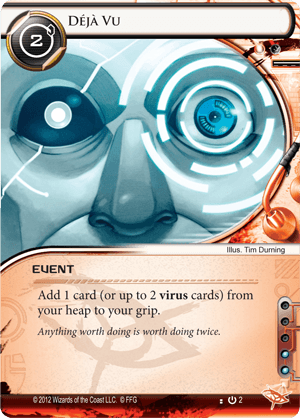 Inject is what this deck craves: cheap, fast, influence-free card draw. It’ll find economy, resources, Siphons and more Injects, while putting Parasites in the Heap for you to Deja Vu back two at a time. Your Knights and Rooks will get less screen-time with Inject around, but that’s fine. In a pinch you can always Déjà Vu back a Knight (Going Déjà Vu-Install-Move-Run). Sure Gamble is a good card. If you find yourself cutting this card from your deck, you are making a mistake. Armitage Codebusting: Just like Dirty Laundry, this takes you from broke to functional. Just mind the fact that it’s a resource, and a smart Corp will trash it if you let them. If you can use it three times before passing the turn, the exchange becomes very unappealing; the Corp would be spending 2 credits and a click to deny you 3 credits. Data Leak Reversal is absolutely bonkers and demands a trash the second it gets online. Just keep it mind that it isn’t actually online until you are actually tagged, so it’s unlikely to do anything in the first few turns of the game. Install it once they are flat broke with a few Fall Guys for best effect. Fall Guy just taxes the Corp 2 credits and a click, for nothing more than a card and an install from you. When you want to buy time, nothing beats a Fall Guy. John Masanori should be installed ASAP, no exceptions. You don’t care about the tag, and you need the card draw. Him being trashed is good news; you have others. Try to get at least one draw out of him before he dies. Joshua B is one of Anarch’s most powerful cards. Learn to love it. Install it when you get it; worst case, it’ll slow down the Corp a bit. No card in the game applies more pressure than an active DLR. Trash it immediately or lose four cards from R&D. Knight is your only breaker. It gets through virtually any ICE in the game, as long as you have the credits. For a deck that aims to land key Siphons, this is very very strong. Knighted ICE is often trashed, which advances your goal of keeping the Corp in the early game. Imp is a versatile card that punishes the Corp for letting you access, even if you don’t find agendas. Trash whatever you find; ICE, economy, taxing assets; every card you trash from R&D ups their chance of drawing Agendas, although trashing from HQ is obviously better value. Lamprey looks weak on paper, but it is utterly devastating in the right circumstances. A surprise Lamprey on an open HQ is like a multi-turn Account Siphon. Be mindful of virus purges; don’t install an Imp and a Lamprey together if you’re not ready to use both immediately, especially if you have an active Parasite. Installing multiple Lampreys is not worth it except in the most extreme of circumstances. Parasite is a key card, dealing with whatever ICE is causing you problems. 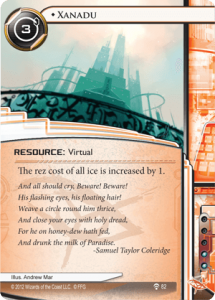 It acts slowly, so you can build up cards, resources and credits while you wait for the ICE to explode. Rook does a lot for you. Its most obvious use is to tax the Corp two credits for rezzing ICE, but it does so much more. If you know the Corp has exactly enough credits to Rez the HQ ICE, a surprise Rook will get you in. Once the ICE has been Rezzed, move the Rook and run again; if you can tax four credits with one Rook, you’re in good shape. Note that Rooks affect all ICE on one server, so there’s usually no need to move them vertically. 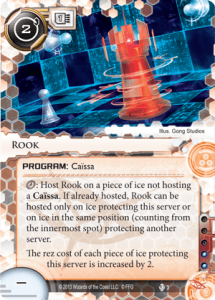 This also means that two Rooks can stack if they have a 2-deep server. And don’t worry if they trash the Rooked ICE without rezzing it; secretly, that’s what you’re after. Most of the words on this card serve to communicate this simple fact: It moves like a Rook. Order & Chaos is sure to bring a lot of worthy considerations to this deck, making the “correct” build a lot less obvious. Steelskin however, is an auto-include. Whenever Steelskin is trashed by taking net or meat damage, draw 3 cards. 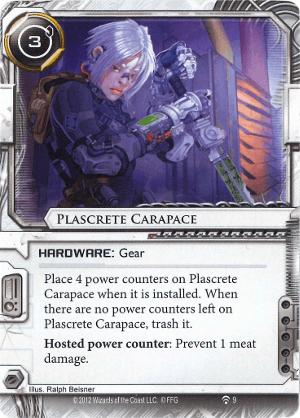 Plascrete is too slow and too conditional a card to warrant inclusion in this deck, but with the presence of Weyland on the rise we really want a way to interact with Scorched Earth without having to include potentially dead cards. Steelskin is the perfect card for this. As a mini-Quality Time, exchanging credit, card and click for 3 cards is decent; if money is no object (such as Post-Siphon) then it makes for a perfectly good Anarch Diesel. But if you suspect Scorched Earth, you suddenly have outs that don’t involve winning before they can assemble 2 cards and 6 credits. A single Steelskin in a hand of 5 cards will keep you alive against Double Scorch. All three will save you against triple Scorch. And it does all this without even leaving your hand. It even allows you to bluff; before Steelskin, a Corp would know with perfect certainty if they could land the kill. Now, they have to guess; do you have the Steelskin? You’ll find that most of the time, the Runner can find a Steelskin before the Corp can find two Scorches. 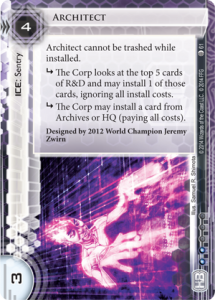 Steelskin is the real deal, and every Anarch deckbuilder will need strong arguments to not include the full three. If the Scorch argument doesn’t convince you, consider for a moment this card’s effect against Jinteki. Go ahead, I’ll wait. 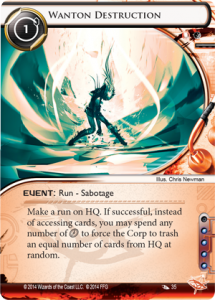 Next up, we have Wanton Destruction; an utterly devastating Run event, threatening to wipe out a Corp’s hand. To say nothing of the synergy with Joshua B.
Wanton Destruction is the Anarch Account Siphon in all but name, just like Indexing before it. Just like Indexing, it’s much harder to land a good Wanton Destruction than a good Account Siphon. The pseudo-priority restriction means that the run must be telegraphed a turn in advance; going for a surprise-Knight play will not be nearly as effective. Still, if you have a desperate desire to free influence, this is a worthy runner-up to Account Siphon as powerful HQ pressure. Finally, we have Day Job. it has definite potential as a straight swap for Armitage, with the downside of being more vulnerable to a Closed Accounts and being less flexible. In the end I don’t really care if this card is worse than Armitage; it wins out on flavor every time. It has raw power on its side; if you have 4 back-to-back clicks to spend, Day Job will get you 8 credits, while Armitage will only get you 5. However, if you have 7 clicks to spend, Day Job will get you 11 credits; the exact same as Armitage. Of course, if you can spend 8 clicks, two Day Jobs will you 16, while two Armitages will get you 12 credits (or 10 credits and a fresh Armitage). In the end, if you value flexibility, Armitage is still the pick. But if you value raw power and speed at all costs, you could do a lot worse than taking four Opus clicks in a turn. In testing I’ve found that with the card draw of Masanori, Inject and Steelskin, we draw into Day Jobs often enough to never need to click for credits, making Day Job my preferred choice. Plus, it enables some absolutely sick turns; suppose you have Masanori and Joshua B installed. Take the Joshua action to run, breaking through some Barrier with the Quetzal ability. Draw a card off of Masanori, get your access, then play Day Job with your remaining four actions. You still have five cards in hand (perfectly safe from flatlines) and you’ve gotten 8 creds + 1 card + 1 access + 1 free break in your turn; at least “twelve” of value in a single turn. Corp players will be hard pressed to match this level of efficiency, especially given you have nothing installed but a couple of cheap resources. Those are three cards that are worth immediate consideration and could be swapped into the deck. Personally I traded Lampreys for Steelskin and Armitage for Day Job. But really, Order & Chaos will bring so many new options that this archetype will likely branch off in many new directions. Only time will tell. There are many ways to build this deck, and this is only one variant. Let’s take a look at some other options. 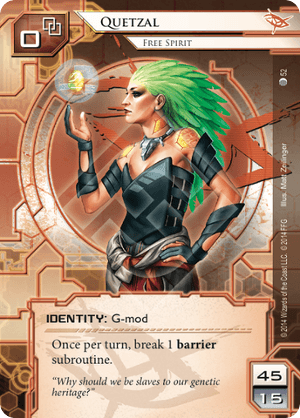 Other identities: Quetzal’s ability isn’t a key component of the deck. 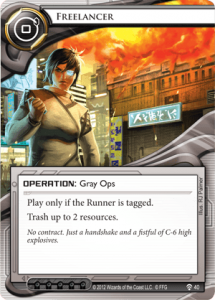 In fact, you could likely run this with any Anarch identity and do well; Reina is an obvious go-to, taxing the corp an extra credit every turn. Noise gets a number of free mills through the course of the game, which can’t be understated; a Noise-variant might play Datasuckers as their value goes up in Noise. Whizzard’s asset-trashing credits will save you some money or Imp tokens over the course of the game. Even the upcoming Edward Kim and MaxX will be good with this deck. So why did I choose to go with Quetzal? Because cheap Barriers are really the bane of this deck, with Paper Wall being a complete and utter nuisance outside of Quetzal. 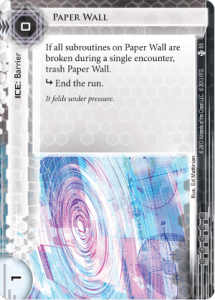 Non-Quetzal variants will want to play 3 Corroders to deal with Ice Walls, upping your vulnerability to Destroyers as well as giving you 2 dead draws over the course of the game. What are you going to do about me? Parasite? Knight? Huh? Consoles: I’d run Desperado if it was in faction, but Anarch console choices are fairly poor. Deep Red will only save you three or four clicks over the course of the game, and you never really need the memory. Grimoire’s only interesting interaction is with Imp, which is not worth the install cost. 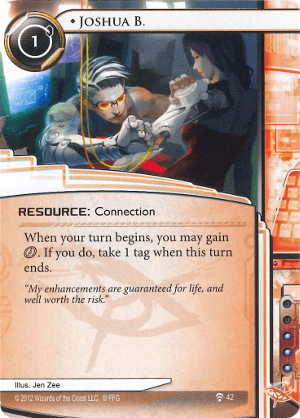 Spinal Modem’s 2 credits a turn seem nice at first glance, but its only use is Knight, making it extremely situational. Vigil looks like it could be an interesting source of card draw and is worth testing. Note that our complete lack of hardware can be an upside in making Taurus look quite silly against us. When is a Corp stuck at their maximum hand size? When they’ve been clicking for credits three times a turn for the past five turns. Same Old Thing: An obvious inclusion in a deck that aims to abuse Account Siphon, I’ve found that this often is not worth it. Déjà Vu recurs Siphons just as well as SOT, and you have enough HQ pressure between Siphons, Imp and Lamprey. SOT is not very useful outside of re-playing Account Siphon; you’re not going to SOT a Dirty Laundry, SOT Sure Gamble means spending 3 clicks and a card to gain 4 credits, SOT Inject is just miserable and SOT Déjà Vu is the slowest play in the world. It’s by no means a bad inclusion, but I find the deck runs better without it. Activist Support: Bad Publicity is extremely powerful for you, and as another “must-trash” resource this is sweet. 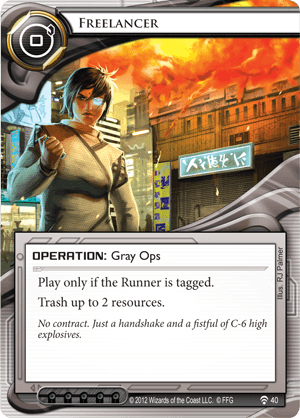 However, the fact that this card is dead in multiples and does nothing if the Corp already has a Bad Pub keeps me from playing it. A virtual Desperado is very enticing, but we have better options. Xanadu: Another “must-trash” resource, the cost of three is what makes me shy away from it. 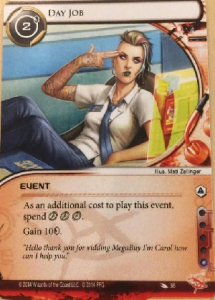 You don’t always come out on top of the exchange when playing Xanadu and getting it trashed, and your economy is not always so robust you can afford to throw credits away. Alright now, be honest; did you actually know what Xanadu does before looking at this image? 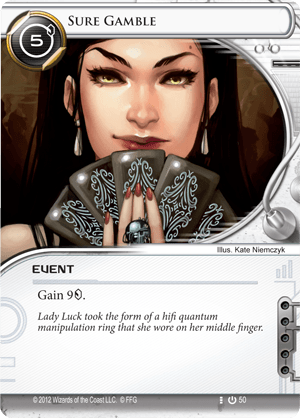 Queen’s Gambit: This is actually a really strong economy card, giving you a Lucky Find effect from 0 credits. The problem is that you often will not have a target and it will sit dead in your hand, wishing it was an Armitage Codebusting. Plus, you don’t really want to be triple-advancing random Jinteki assets. Clone Chip: Definitely a tempting inclusion with Inject, getting you back whatever you need when you need it. Cutting a Siphon for 2 Clone Chips is worth a shot. Vamp: Account Siphon is just so much better. This deck doesn’t have the economy to support Vamp; you operate on low credits at all times, and you want the Corp to do the same. 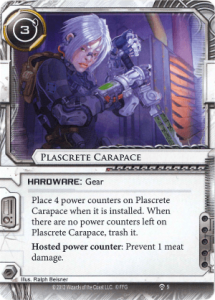 Plascrete Carapace: We just don’t have time to pay three for it. Installing this once or twice will set you back so much that you’ll give the Corp the breathing room it needs to secure its servers. Plus, given how reliant we are on the click to draw, we can’t afford to play potentially dead cards. We need all our cards to be live, all the time. Playing safe is for posers. 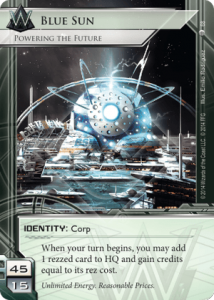 Do you want to play an Anarch deck that really feels like an Anarch deck? Do you like face-checking ICE and watching the Corp struggle over the loss of every credit? Do you want to taste the frustration of your opponent as they draw their card for the turn, stare at your board, Purge away your lone Lamprey and then discard for the third turn in a row? If any of this sounds enjoyable, I recommend you try Breakerless Quetzal. And that’s all for 2014. Deckspace will go on a short hiatus over the Holidays and will be back sometime in 2015. Feedback is, as always, highly appreciated. If you have any suggestions for deck archetypes you’d like to see me discuss, email me at Nagnazul@gmail.com. Until next time, keep on running, and keep on breaking the Corp.
Anarch, Breakerless, Deckspace, Denial, Quetzal, Reina, Resource.